Now that the Christmas presents have all been delivered, I can share them on my blog! *smile* Handmade crafts are simply the best gift to give and receive (at leasts for us crafty types!) and I had the greatest time creating presents this year. Since I work in a scrapbook store, I simply had to create my own gifts 'cause it just wouldn't be right to give other crafters something from a store! Today's project was created for one of the other instructors at our store, who is one of the most talented paper crafting ladies I know as well as being a very skilled clothing designer so I wanted to give her something that married her love of paper crafts and clothing. This is what I came up with! I was actually inspired by a project found on Splitcoast that was created by Janelle Stollfus. 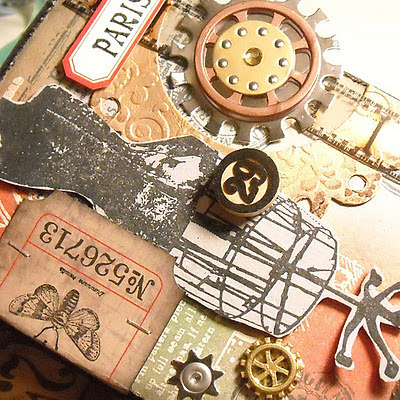 I loved the elements on her page and followed a similar layout. 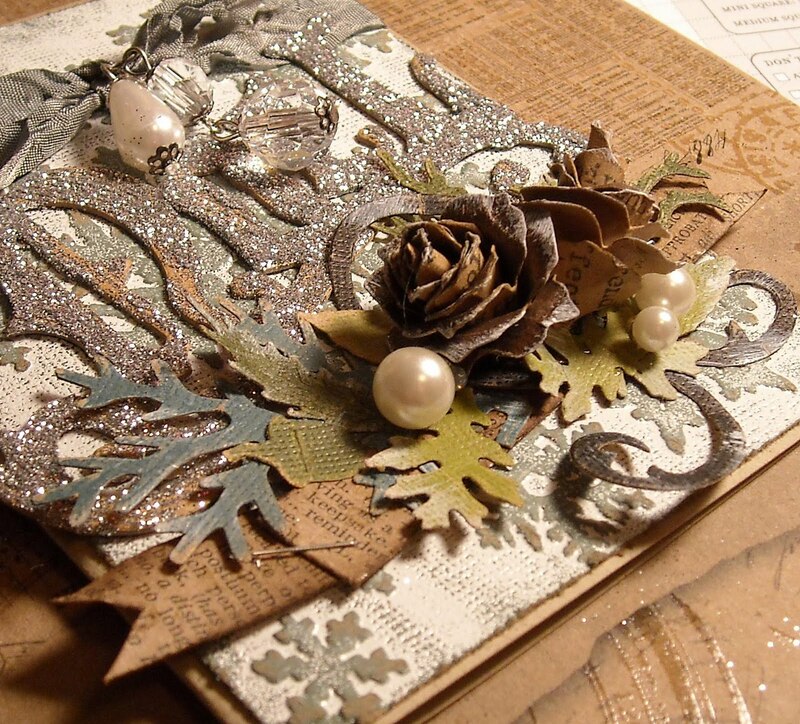 To begin, I used this great pattern kraft paper from Tim Holtz. The paper is already embossed so once I applied ink over the entire page, the detailed lines appeared. I then aged the paper by using water and a variety of inks. 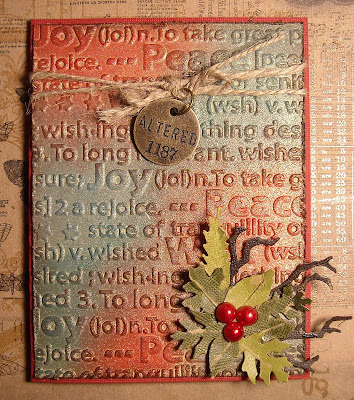 I then added the embossed (and distressed) kraft cardstock. 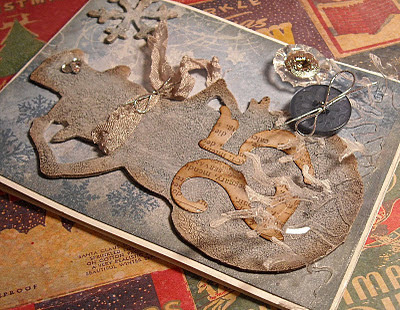 These pieces were created by using embossing folders. Next came those big 'ol flowers, which are from Petaloo. I toyed with creating my own flowers but these were so pretty that I opted to use these instead (and they were the perfect color!) 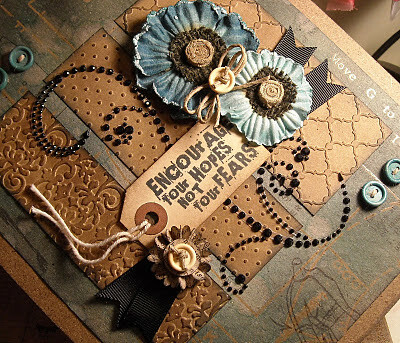 I added a sentiment, stamped on a mailing tag (sentiment from Tim), rhinestones, buttons, and a few snippets of ribbon. It's those extra embellies that make all the difference! Oh, I did make the tiny rosette, using a die from The Cat's Pajamas. Greetings!! I hope everyone is doing well and had a lovely holiday! We celebrated Christmas yesterday and so I'm just started to come out of the holiday fog! I'm at work today and enjoying be back out among all the fabulous paper crafting goodness! Here's a close up shot of all that amazing sparkle and shine! 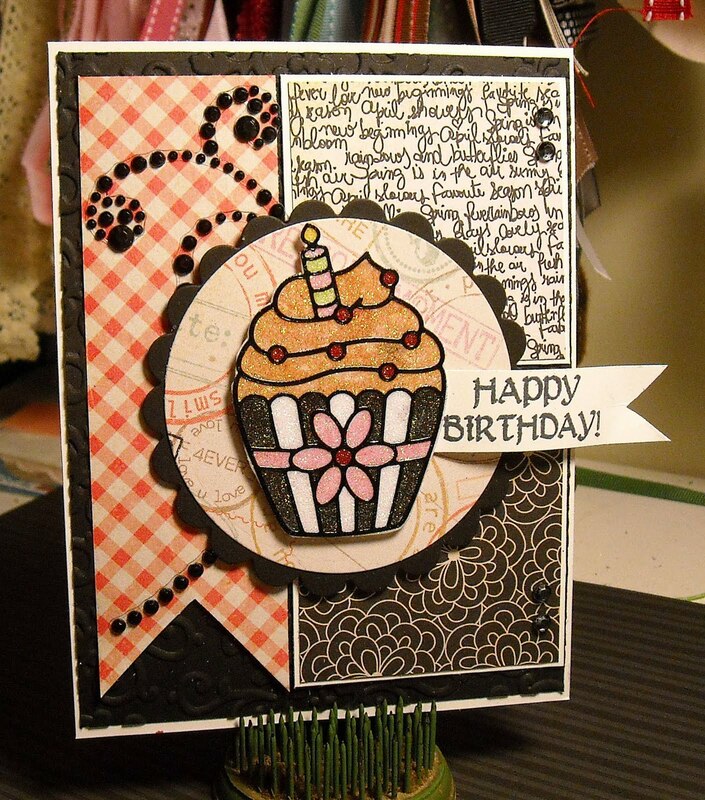 The designer paper is from Fancy Pants Design and the rhinestone swirl is from Zva. And here is the video - enjoy! 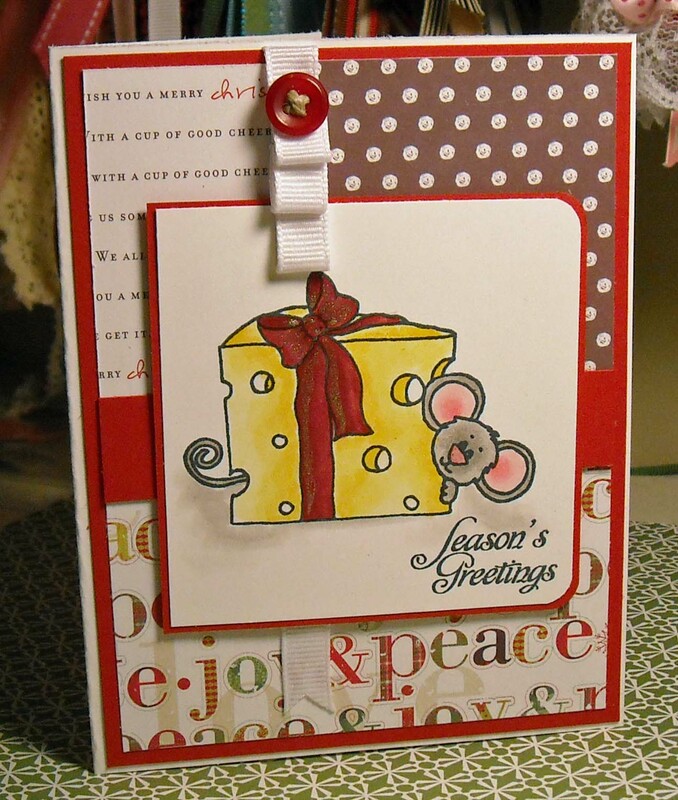 This image is from the A Cocoa Kind of Christmas stamp set and has been colored with Copic markers. The designer paper is from Little Yellow Bicycle (love this line) and the ribbon and button is from my random stash. I also added a tiny bit of bling to the ribbon, you can just see the shine is the photo. Enjoy today's card and I'm hoping you have a very blessed Christmas! Hi there friends! 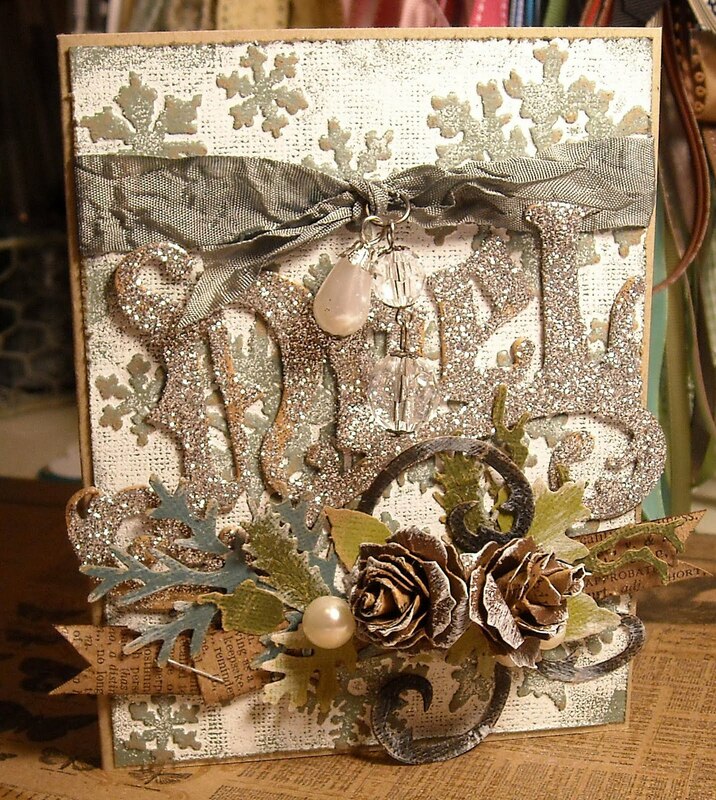 I'm taking a bit of a break from the Tim tags/cards today to share a recent Paper Smooches creation. I love their images and recently purchased a few sets, one of them being this coffee-inspired set, Hot Concotions. 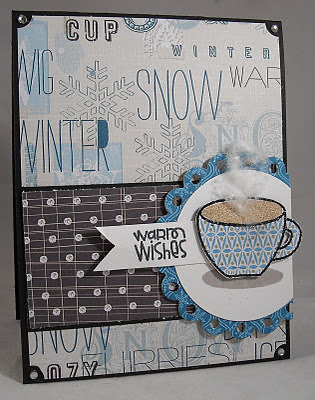 Seeing as we have a dusting of snow and ice outside and I'm sitting at my PC sipping my second cup of coffee today, this is the perfect card to share!! 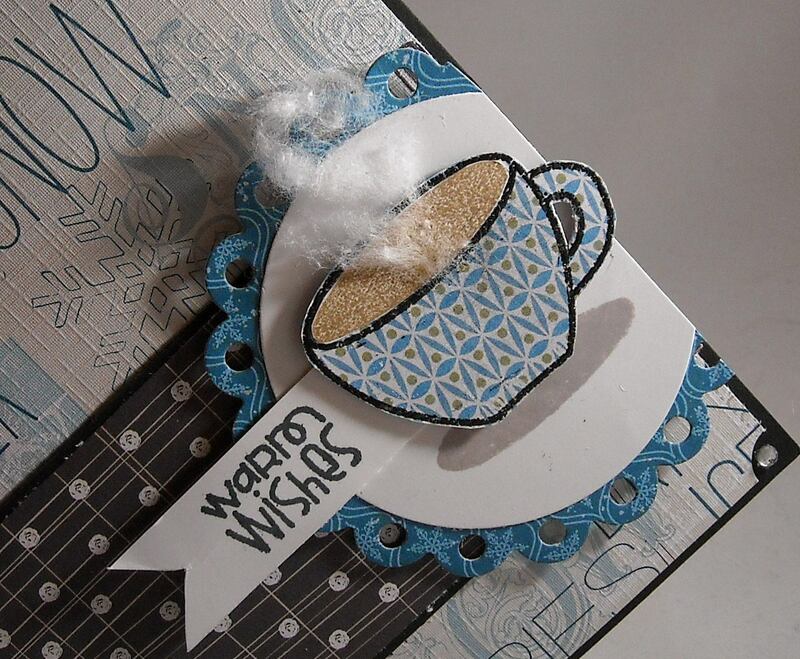 I used designer paper from Little Yellow Bicycle for this card and some paper piecing for the cup. I stamped and embossed the cup image on white cardstock and then restamped the image on the designer paper. The designer paper was cut out and glued on to the white cardstock. The small oval shape, acting as a shadow under the cup, is also included in the set and can be used as a shadow or as the beverage inside the cup (which I did too)...fun, right!!? The tiny bit of steam is a piece of cotton that I pulled and fluffed before added with a bit of liquid glue. The sentiment was stamped on a paper banner and attached with one edge under the cup. 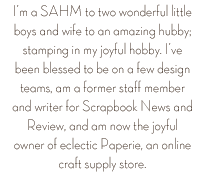 Enjoy and be sure to check out the Paper Smooches site! 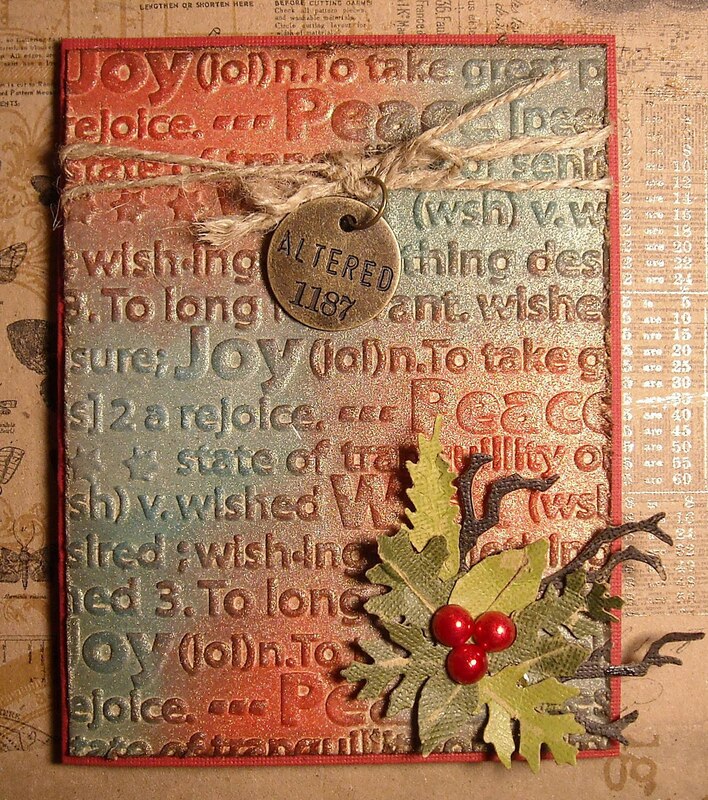 Today's card was another adventure in creativity as I considered how I would re-create Tim's Day Nine tag, seeing as I didn't have any of the products that he used on his tag. 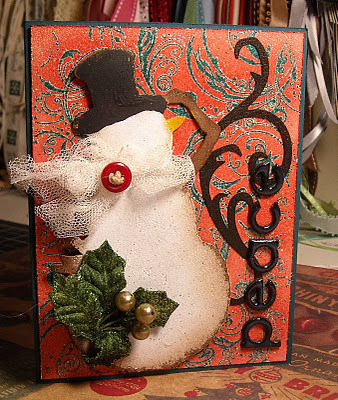 I was actually almost finished with the card when I remember the snowman die and that fact changed the entire design of what I had in my mind! This card started with lots of embossing...check out that shine! The background was actually embossed twice. First the background swirl image was stamped and embossed (the stamp is from Impression Obsession) and then red ink was applied to the entire background with a blending tool. Once the red was on the card, the entire card was embossed. Super-duper shine! Then came Mr. Snowman, which I painted with Paint Daubers. Once the paint was dry, I of course sanded the edges for that vintage look! Then Mr. Snowman was nicely dressed with a scarf and holly leave (from Petaloo). The peace sentiment is from my stash of sticker letters and the swirl is from a Tim die. The final step was adding Glossy Accents to the letters for, you guessed it, more shine! 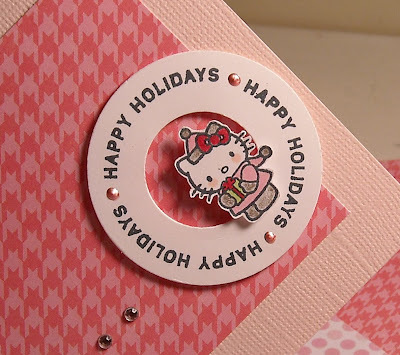 For today's card I was missing the stamp sets, die cuts, and some of the embellishments that Tim was missing. However, I did have this fun dress form stamp set in my collection of Tim stamps and realized that it had the same look as the one that Tim used. 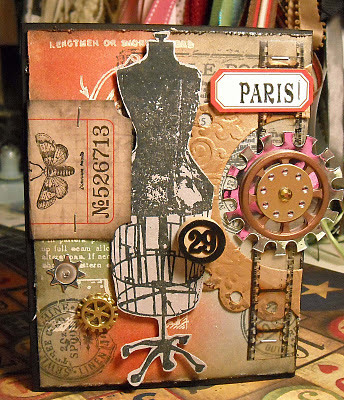 My background was stamped with some of the word stamps that came with this set and the dress form was stamped on grungeboard. 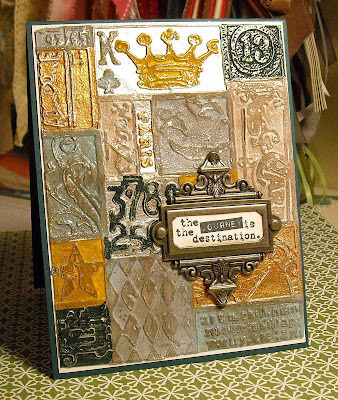 Tim used a clock face die for the large background die but I used a punched scallop die from Spellbinders to act as my "clock." Tim used his gear die to fill the open area in the clock but since I didn't have the die, I picked up a fun package of gear stickers from Jolees. 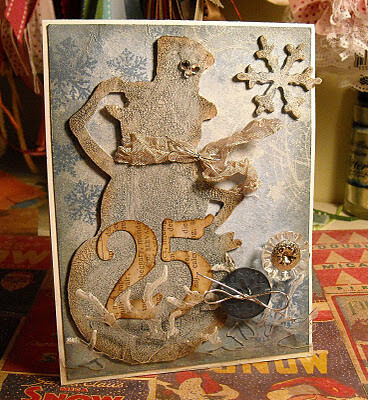 I did have the film strip, vial label, and ticket so I was able to add those fun tidbits and then instead of adding a metal number 25, like Tim did, I opted to use this fun wooden game piece, which is noting the age I wish I still was! LOL! This is so my style and I was just in love with the end results! A HUGE thanks to Tim for the inspiration and techniques!! 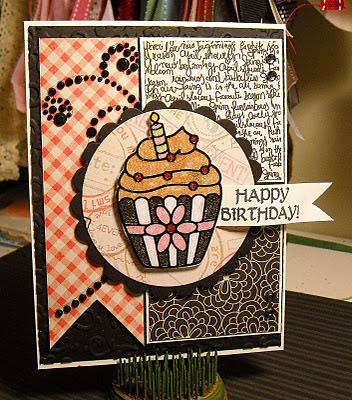 Welcome to the Sweet 'n Sassy Stamps Crazy 4 Cocoa blog hop! We all adore Cocoa and thought it would be fun to showcase him all month long. 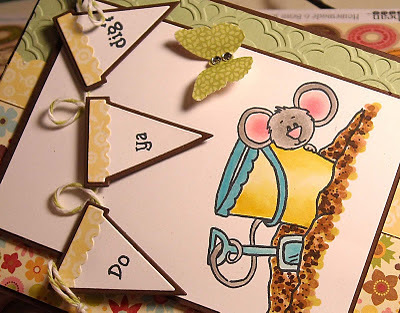 Today, as part of the fun, the Sweet 'n Sassy Design Divas have joined together with e few of the talented Sweet 'n Sassy Digi Challenge ladies to bring a great Cocoa Mouse blog hop to you! Make sure you've got your warm drink and some chocolate...let's get ready to hop! Be sure to scroll to the very end of the post to read all of the details on the prizes! So...I know, I know my Cocoa card is showcasing a warm day at the beach instead of snow and all things hoiday but seriously how could I resist using this charming little image from the Beach Bum Cocoa stamp set?! I know it's just barely the end of December but I'm already ready for the warm days of summer and I had a blast creating this card with the tiny banner (from My Favorite Things), flowery paper (from Jillibean Soup), and darling Cocoa in the sand! The butterfly is from a Martha Stewart punch, the sweet twine on my banner is also from Sweet 'n Sassy, and the embossing on the green cardstock is from a Lifestyle Crafts embossing folder. And the entire image was colored with Copics!! I hope you enjoyed my card and it made you think of warmer days to come!! Want to see more Cocoa? Then join the rest of the team on today's blog hop! Here's the entire list! But wait...there's MORE!!! We want YOU to hop along with us! 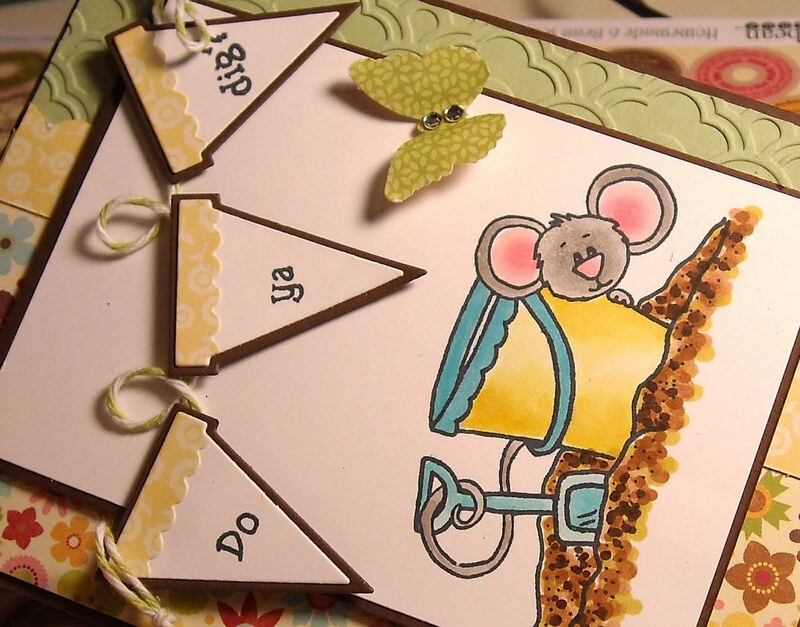 All you have to do is make a card or project featuring Cocoa Mouse and add your direct link to our linky tool below. One participant (drawn at random) will win their choice of ONE free Cocoa Mouse clear stamp set or FOUR free Cocoa Mouse digis! You have until Saturday, December 17 at 11:30 PM EST to add your direct link...go get stamping! Don't forget, during the month of December we really are Crazy 4 Cocoa. The entire line of Cocoa Mouse clear stamp sets and digi images are 10% off! 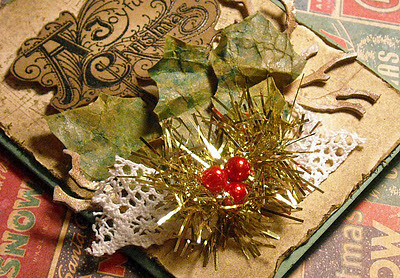 The leaves were created using the Glassine paper and then I simply added some branches, ribbon, sparkly stuff, and holly berries (pearl embellies that I colored with my Copic markers). 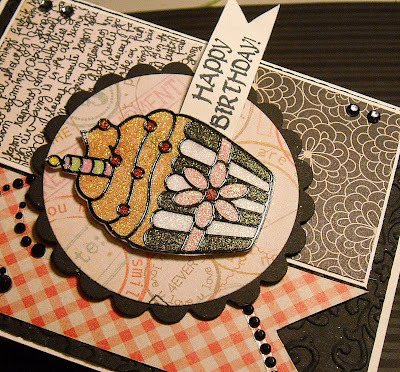 The background of the card was aged with Distress Inks and the sentiment was embossed in black. Pretty easy today...Be sure to check back over the weekend for Day Eight's tag...it's my favorite so far!! And be sure to join the entire Sweet 'n Sassy team tomorrow for the Cocoa Blog Hop! Lots of prizes involved so don't miss out! Welcome to Day Six and the first of my "doozey" cards...this are the tags that Tim created where I initially had a hard time figuring out how I was going to re-create his look in card format. On Day Six, Tim featured the embossing using sticky back metal sheets, which I confess are wonderful tools...love the metal! However, I had no metal in my stash and the store was out of stock so I could have either waited until new stock arrived or come up with something different. So...I went with something different. Want to guess what it was? Aluminum foil! That's right, I grabbed a sheet from the kitchen, doubled it for extra strength, wrapped it around a piece of cardstock and ran it though my Big Shot, using a Tim embossing folder. The results? Stunning! The embossed metal was just beautiful, perfect the way it was, but I wanted to continue using Tim's techniques so I added the paint! I used paint from the Ranger Paint Daubers that I had in stock, which weren't holiday colors but I like them just the same. Once the blocks of paint were dry I very lightly sanded the raised areas and since this wasn't actually metal I did need to be very gentle with the sanding. Once the sanding was completed, I covered the entire tag with Walnut Stain Distress Ink and clear embossing powder. Then the magic happened. Once the embossing powder was heated and cooled I was left with this amazing little piece of art that resembled an old license plate. Very cool! My final addition was the metal piece, which Tim also used on his tag, but he used a wreath and since this wasn't a very Christmas looking card I opted to just add a metal tag and sentiment. There you have it...Day Six!! Welcome to Day Five!! And I have to confess that I am running behind, not only with my posting but with my creating. I've made it to Day 7 so today...I need to be crafting!! :-) I only have to confess that the Day Five technique is a tough one for me...I can never get it to work the way Tim does! So...my card is slightly different today with my words being in black instead of white but all the other elements are the same. In general, this was an easy creation (with the exception of that darn inking technique that Tim does so well and I can't figure out!!). The words, from the Papillon stamp set (from Tim), were stamped on to a piece of plastic, which was cut out of some packaging..isn't that cool?! I then used a die (Fall Greenery from Tim) to cut out some leaves and believe it or not the little branches things are from a tree punch...I just cut off the trunks! I created the wreath with the "trees" and then filled in with the leaves. I then only had to add pearls and a white bow...fun, right? Be sure to check back on December 15 for the Sweet 'n Sassy Cocoa Blog Hop...Prizes and lots of wonderful designs to share!! And check back tomorrow for the Day Six tag!!! Welcome to Day Four!! (I need to get busy with posting, it's almost the end of the 12 days!!) This may not come as a surprise but I have been having a blast creating these cards and today's card is no exception! I adore the technique that was used to create the snowman. You can visit Tim's blog for all of the details but let's just say that the technique involves crackle distress paint...swoon! I also love the icy look of this card, just perfect for winter. There are accents of painted plastic, glossy dictionary numbers, tiny bits of tolle, stamped snowflakes (from Sweet 'n Sassy), sparkly snowflakes, shiny buttons, and seam binding ribbon from The Cat's Pajamas (a favorite product, you should check it out! )....really, what's not to love! Enjoy and check back often for more Tim-inspired cards! 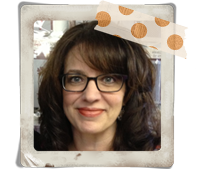 And mark your calendar for December 15 when Sweet 'n Sassy will be hosting a Cocoa-themed blog hop!! Can't wait!! Oh, that Tim...he's really going all out this year! He's using technique after technique and lots of new products...I'm really having to be super creative in 2011! LOVE IT! 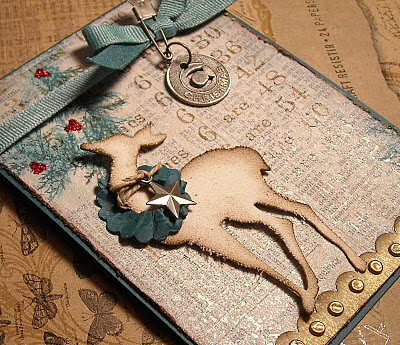 Today's tag was super easy to create and although my card looks a bit different than Tim's the same technqiues were used; embossing, adding color with a blending tool and Distress Inks, and using gold Perfect Peals. And then for the bling...gold Perfect Pearls...doesn't that just rock! The gold shimmer is just amazing! 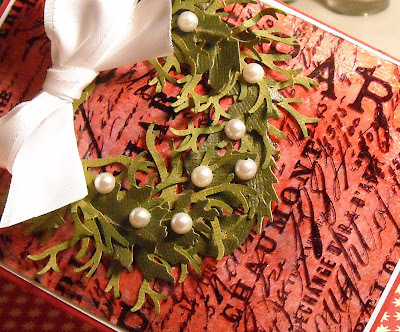 I then added the twine and altered metal tag (had to go with that saying 'cause this project was definitely altered!). The greenery at the bottom of the card was created using Tim's fall die and Kraft Core-dinations cardstock. The three holly berries were actually white, I colored them red using Copic markers. Enjoy and stop back tomorrow for more!! Another quick interruption to the 12 Tags of Christmas...My card created for this week's CAS (Clean and Simple) challenge this week at Splitcoast. (And did I mention that I did get a guest spot on the CAS design team - Yipp!!) This week's challenge was to use twine on your card. I'm loving twine! I also have this card posted on the Sweet 'n Sassy blog this morning...head on over there for all of the details and check back tomorrow for the next Tim card! Enjoy! I'm back with Day Two of Tim's 12 Tags of Christmas!! (You can call mine the 12 Cards of Christmas!) This is where I start to find different ways/products to use to re-create the looks that Tim has on his tags. 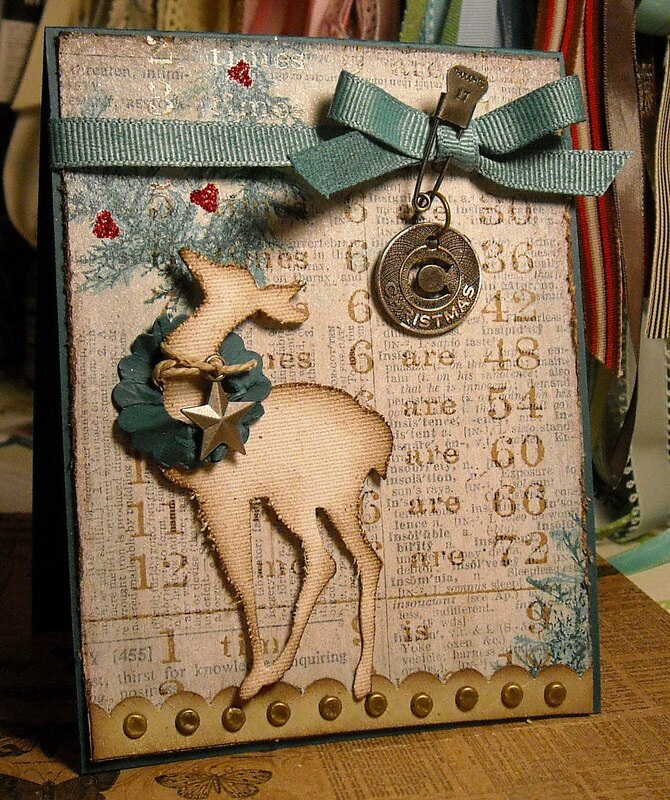 Today's tag features this darling deer image, which has been die cut using sticky-back canvas. (Love that stuff!) I also was able to use some of Tim's embossed Kraft cardstock. I don't have the Christmas line but used the one that I had. I also don't have the Distress Stain that Tim used on his tag, to make the background white, so I just used a paint dauber, which worked perfectly. The other items I was missing? A holly stamp, the decorative die Tim used for the bottom of the card, and tiny green garland! I used a pine branch for the holly and used red Stickles to create the berry and I used two Spellbinders dies (a scalloped and plain) to create the wreath around the deer's neck. I also used gold paper and a scallop punch for the scallops at the bottom of the card vs. painting grungeboard with gold paint. And so far the next few tags have really stretched my creative imagination in trying to develop clever ways to re-create the looks...so. much. fun.!! Enjoy today's tag and check back on Friday for number three!! 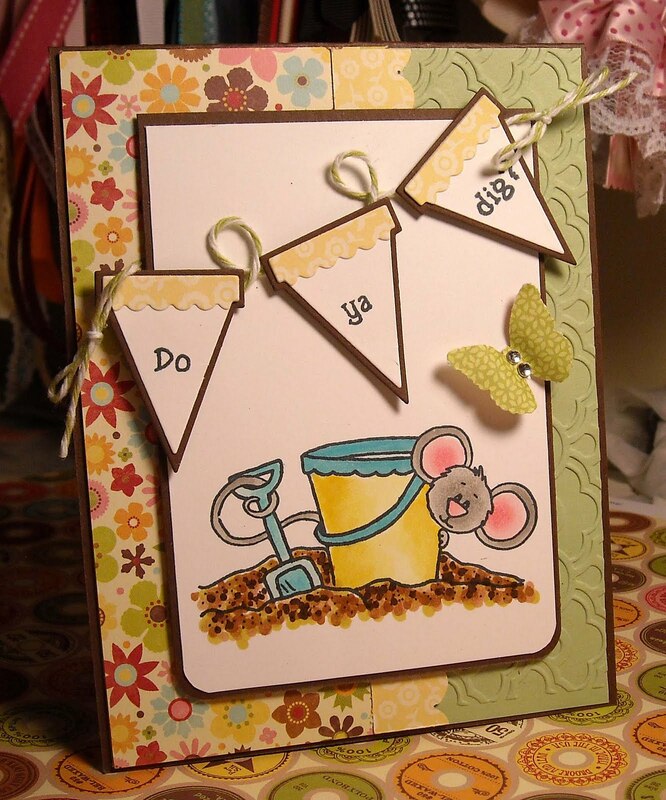 ETA: Wanted to let everyone know that I've entered this project in to the Dolce Stamps shine challenge for this week! You can check out the details here...prizes involved!! 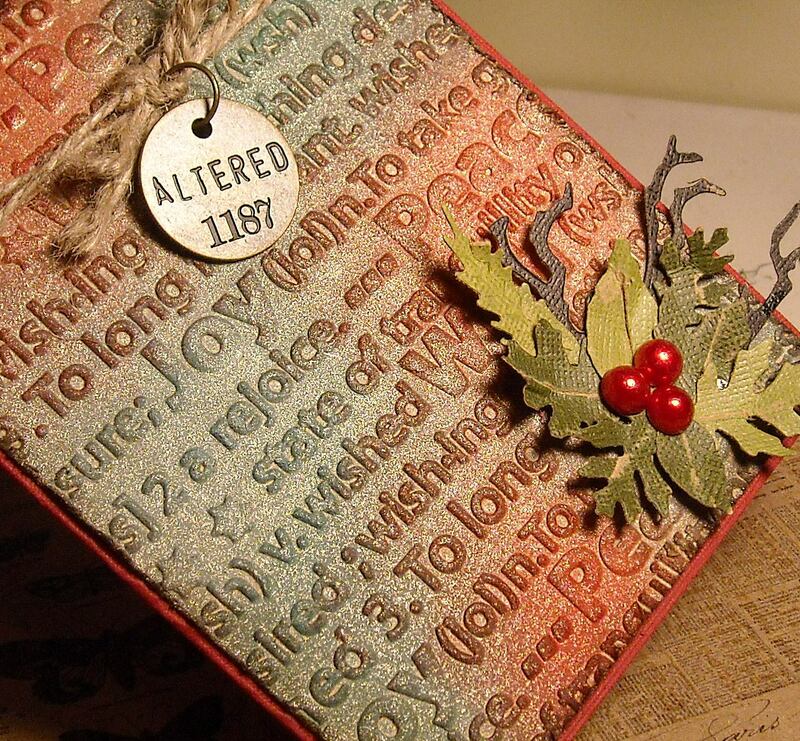 I'm excited to be back sharing my December Say it with Letters project! (Back to the Tim tags tomorrow!!) For those of you who don't know, SIWL is a company that produces wooden letters and shapes (even custom work!) that can be easily altered with paint or paper. Check out their products, they're fabulous! I knew that we had some great white sparkly paper in the store so I picked that up and got the tree covered. 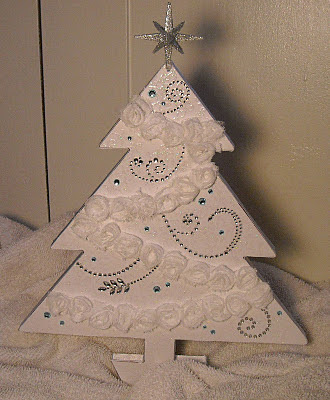 (I used Zip Dry to adhere the paper but any strong glue will work) I used white stain ribbon to cover the edges of the tree, again using Zip Dry. 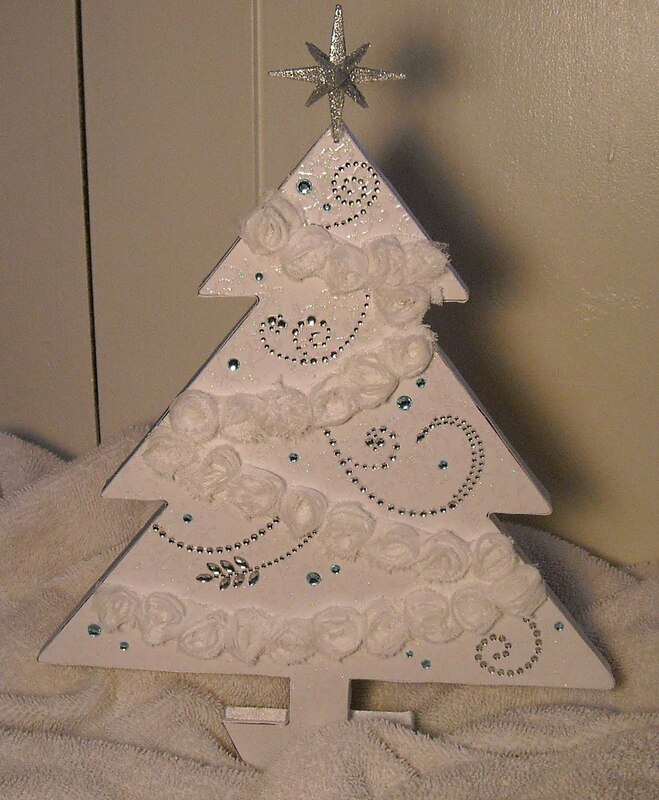 As I was holding ribbon, waiting for glue to dry, I spied the white rose ribbon sitting in my ribbon tray (ribbon by Tim Holtz) and thought I'd give that a try to see how it looked on the tree. Insert happy face as I attached the first piece of ribbon...love the white roses!! 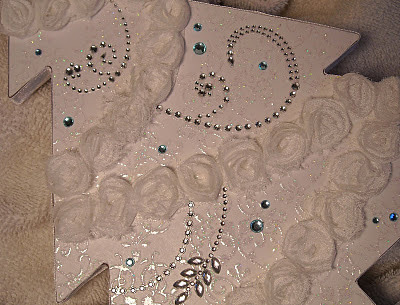 Then I needed to add some bling...I toyed with all kinds of options but ended up using the rhinestone swirls from Zva. 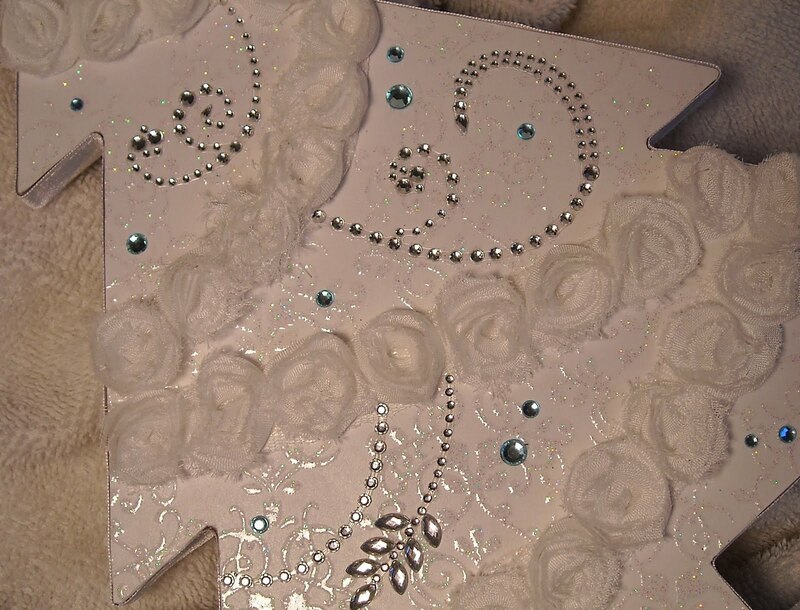 I just can't get enough flowers and rhinestones!! I then added a few icy blue single rhinestones to act as ornaments. (I actually started with red and my youngest, who was watching me, said, "Mom, you need to use blue, red doesn't look that good..." Smart boy!) The last element was this fabulous sparkly star that I picked up at my local craft store. A touch of hot glue held the star on perfectly! Want to see what everyone else on the team created (you'll love the different designs!! ), head on over to the SIWL blog! So...did you all go and visit Tim's blog last week??!! No, then get on over there because he has started the 12 Tags of Christmas! Yippee and Ya-Hooie!! I'm so excited about the 12 Tags!! This is my third year joining Tim and I can't wait to see what he has in store for the next week! And guess what? I had to re-create Tim's Day 1 tag..I know, you're not surprised, are you? Well...I did make one change this year. 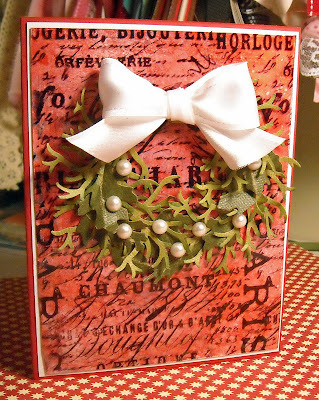 I opted to create cards instead of a tags this year...just for a little something different. This tag was quite a creation! A whole lot of glue, distressing, sanding, die cutting, and glitter! I believe that my entire room, and perhaps my entire person, is covered in fabulous silver glitter! Love it! This was an involved project...lots of steps and time required but the end result is amazing! Really beautiful in person!! See Tim's blog for detailed instructions. So...I have a confession...since I have been working at a scrapbook store, Wholly Scrap!, I'm able to pick up some of the exact supplies that Tim uses on his tags (oh, it's so bad!!) so my first card is almost identical to his tag. But...that won't be the case for the rest of the days. My favorite part of Tim's tags is the challenge to re-create a card or tag using the techniques that he uses, not necessarily uses all of the products that he uses. And I can't wait to share the next few tags so check back in each day for more!! 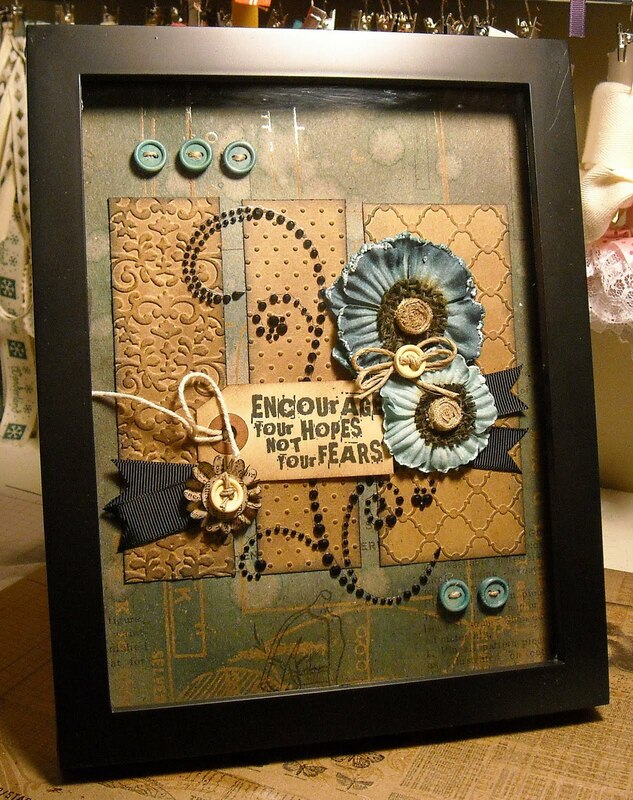 Welcome to the PSA Essentials/Cottage Cutz Blog Hop! I'm so happy to have you joining our group today! 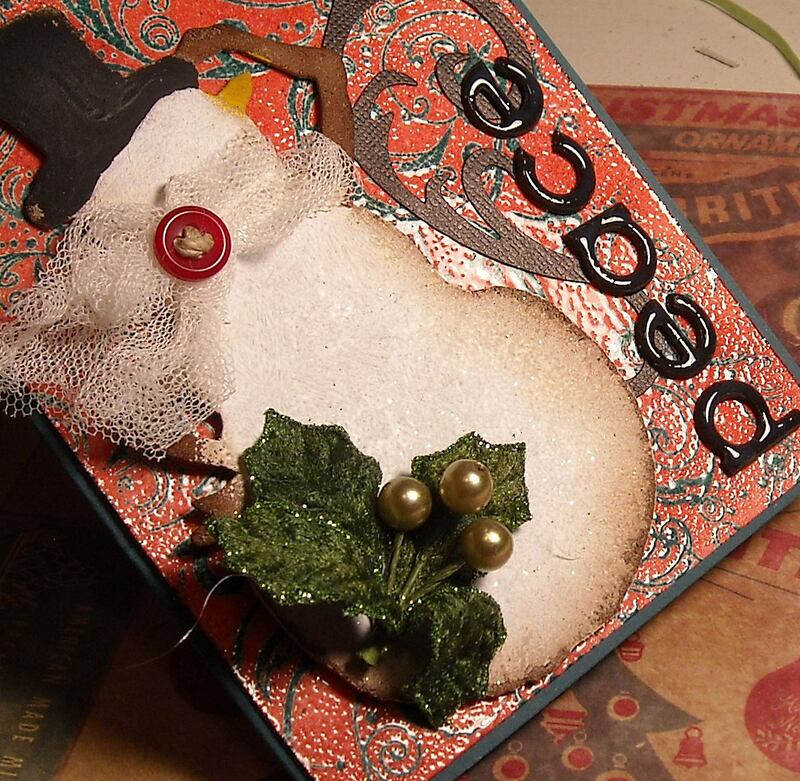 During today's blog hop, we'll be sharing ideas for creating your own handmade holiday cards and projects. And since this time of the year is so busy for everyone, I'm all for quick and easy projects! We have a great list of designers joining us today and you should have arrived here from Lorie Souther's blog. (A complete blog list is included at the end of this post in case you got lost along the way!) Don't forget that there are prizes being offered during the blog hop so please read those details at the end of my post! For my card today I went with a clean and simple design layout that can be used for any color combination, greeting, or image. 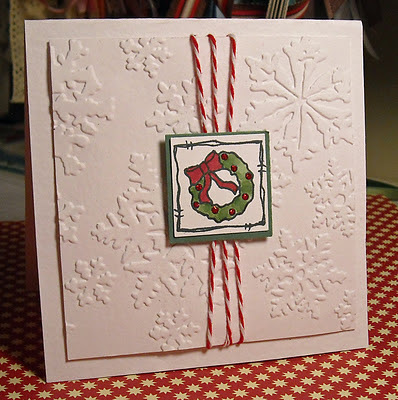 Simply change out the pink cardstock for red, attach a piece of red and white designer paper, a Merry Christmas sentiment, and a tree image for a whole new look! 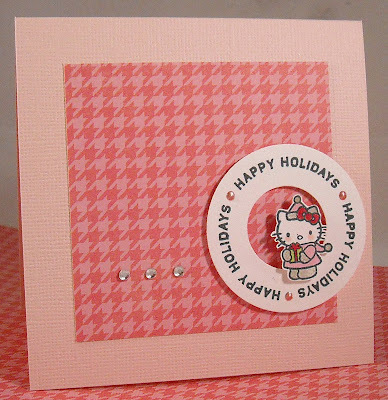 Now I confess that I have a thing for non-traditional holiday colors and this year pink has been my thing and what could be cuter than the color pink, a houndstooth pattern, and Hello Kitty! 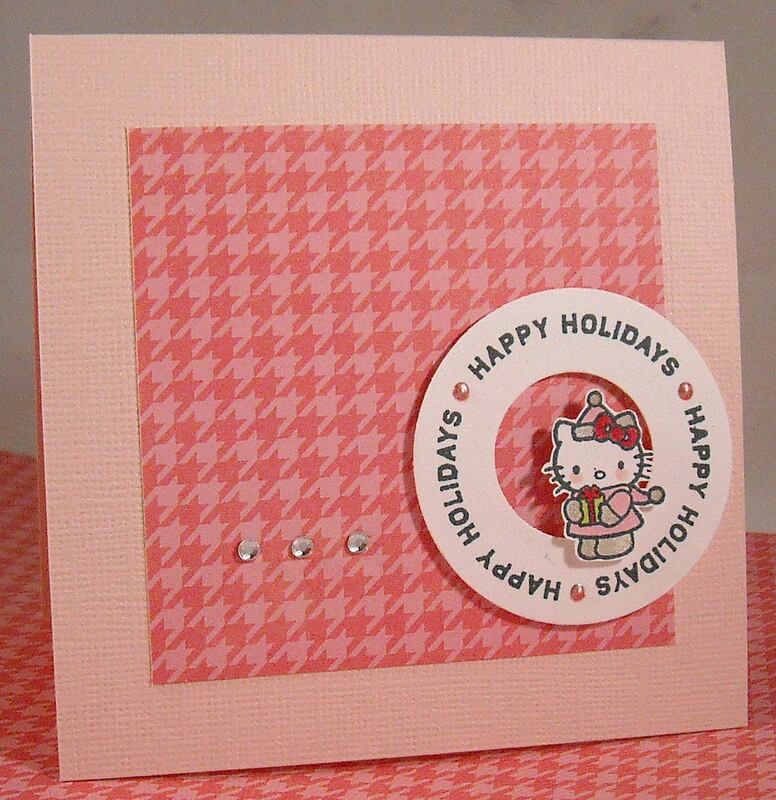 I adore the Hello Kitty images from PSA...they are darling! I have no doubt that my girlfriends would like nothing more than receiving a all girl-inspired card this year! And what pink card would be complete without a few rhinestones, glitter (on Kitty's hat and boots), and shiny Perfect Pearls! I hope you enjoyed my CAS card (this would be a perfect design for mass producing cards!) and that you have an opportunity to visit the other ladies on the hop! Your next stop is Pearl Liu...Here are the prize details! PRIZE PACKAGE DETAILS: Readers who hop to each of the blogs, comment at each, and are a follower of PSA Stamp Camp will be entered to win the “Holiday Card” prize. 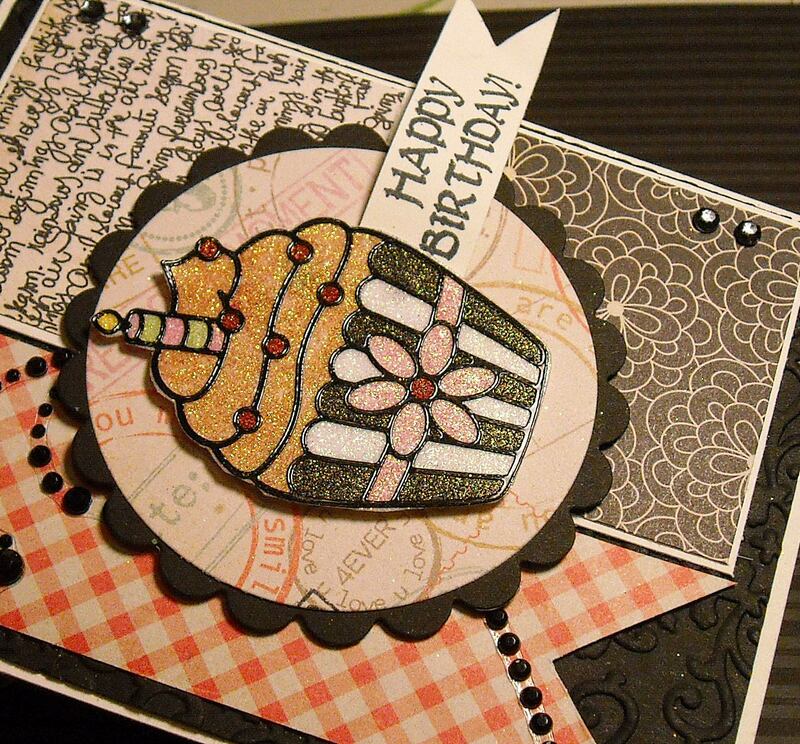 This prize contains 3 Peel & Stick stamp sets, 1 stamper, 1 black ink & 1-2 color ink from PSA Essentials. The winner will also receive a $50 gift certificate to The Scrapping Cottage for the grand prize. There are also 9 opportunities to win a 3 x 3 die from The Scrapping Cottage. So...I tried out for the CAS team on Splitcoast last week and...I made it to the semi-finals! That fact was so exciting for me! I love the CAS team and love their challenges...and it is a challenge...keeping it simple is not easy for this not-so-simple girl! However, it is a style that I definitely enjoy and want to keep working at perfecting! Unfortunately I didn't make it to the final round of try outs but there's always next time! I'm excited to see who they pick for the team! 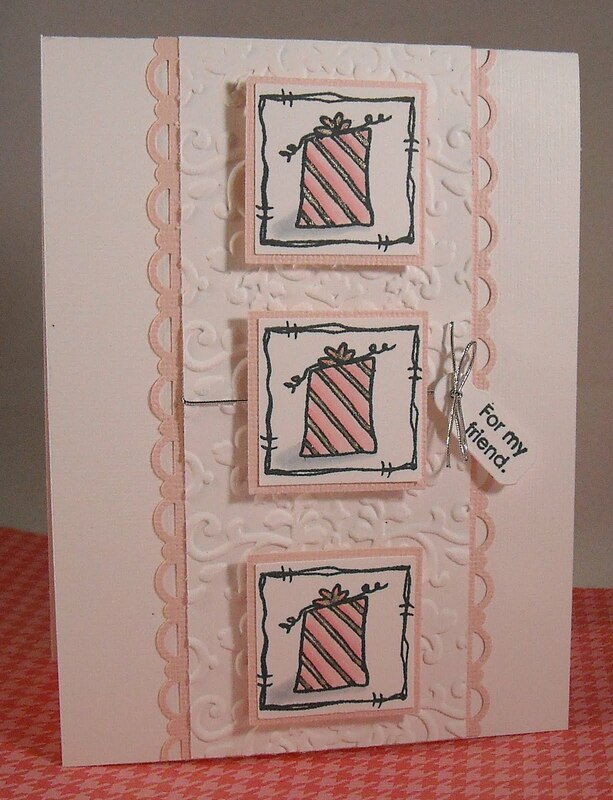 Our second challenge for the semi-finalists was to create a card featuring presents. I created two cards for the challenge and this is one of them! (I ended up posting the other as it was a bit more simple and sometimes you can't help but wonder if you should have gone with the other option!!) 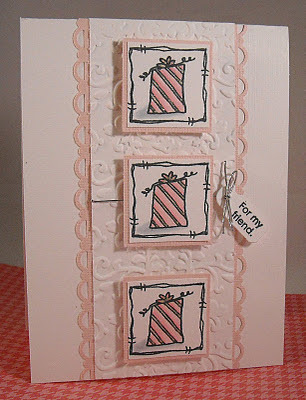 No worries, now I get to share this card featuring a sweet present image from Sweet 'n Sassy today! 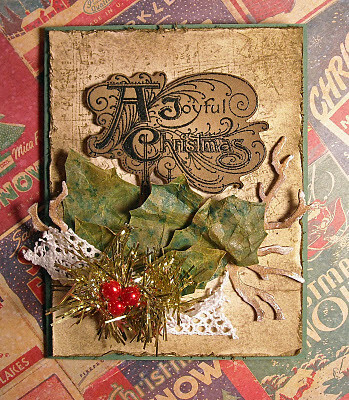 This image is from the Christmas Itty Bitties stamp set and is the greatest set that includes six itty bitty stamps! 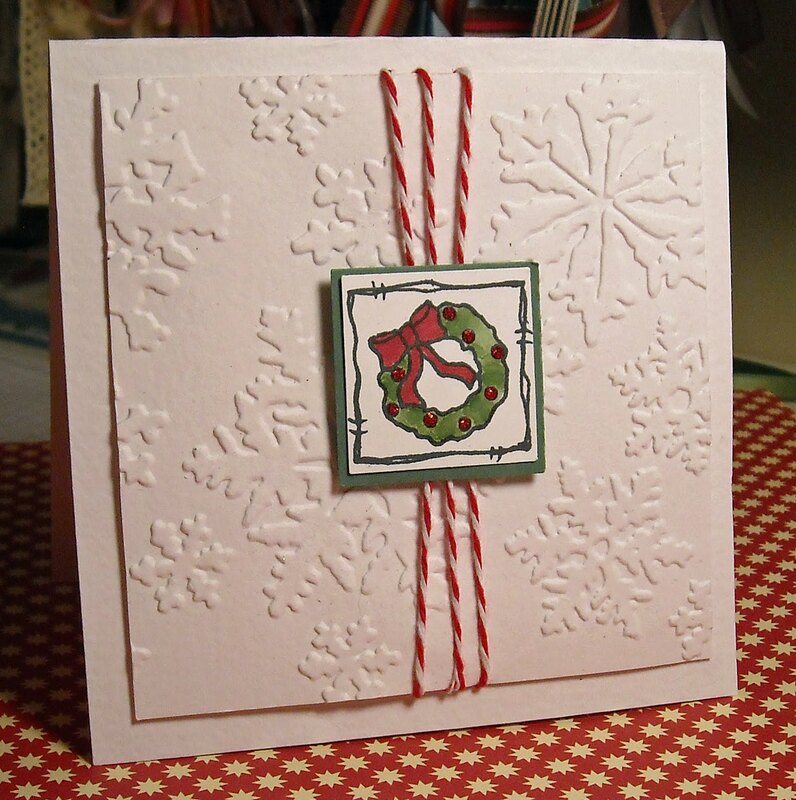 The design is fairly simple, an embossed panel and a few scallops on each side of the embossed area. My three little presents are colored in pink and glitter stripes (I've got a thing for pink lately!) and backed by a pink square. While I didn't make the team this time, I hope you enjoyed today's card and you take a moment to check out the CAS message board on Splitcoast! PS - PSA Essentials blop hop on December 1 - be sure to check back for all the details!